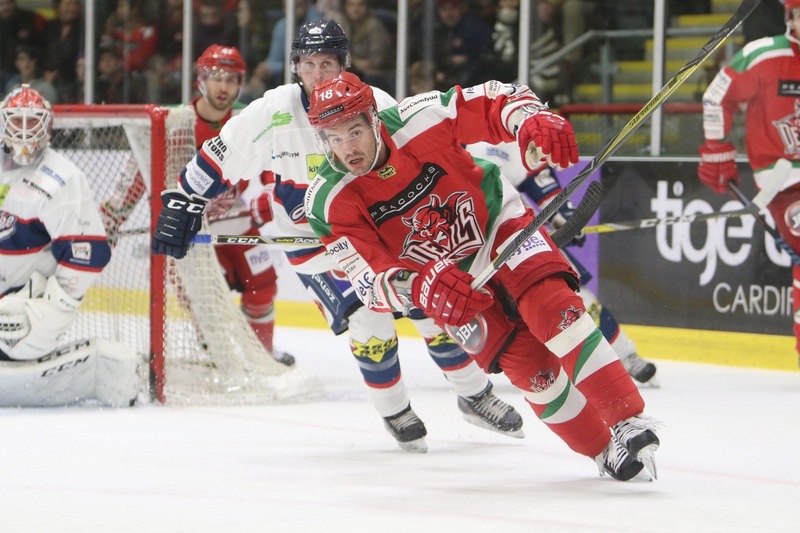 Layne Ulmer was back in the Cardiff Devils team after completing a three-match suspension. Pic: Helen Brabon. Andrew Lord has called on his Cardiff Devils players to hit ‘full throttle’ from the start of Wednesday’s home clash with Guildford Flames. Devils were left frustrated after losing against struggling Dundee Stars at the Viola Arena in Cardiff Bay on Sunday, although head coach Lord and his players did earn three points from a possible four over the weekend. They are still in touch with Belfast Giants and have to play the leaders another five times in Elite League fixtures. Devils hope to have defencemen Mark Richardson and Drew Scheistel available to face Flames, although they will have to sit out one import. Lord was delighted by Devils’ performance in their 8-3 win at Fife Flyers on Saturday, saying: “That was phenomenal, one of the best by our team in over a month or longer. A total team performance. “We had energy, excitement to play, passion, togetherness and a killer instinct. “There have been a few flat starts on home ice when we have allowed teams to get into the games, particularly trapping teams like Dundee. “Our second period was great. We were all over Stars and could have scored more. “We got one late in the second period, but that was unfortunately waved off. The goalline technology was down at the time and it couldn’t be checked. “The third period wasn’t good enough as a whole. Defensively we had some lapses and when it comes to a shootout anything can happen. “Stars defended hard at times when another goal or two would have been crucial, but we need to defend better. “We had to work hard to score our goals, but on the flip side we let the puck into our net without much of a challenge. TICKETS – You can still buy tickets for Wednesday’s home game against Guildford plus other fixtures ONLINE HERE or by calling 0800 0842 666 or in person at the reception desk at VIOLA ARENA right up until face-off at 6pm. Tickets for Devils games are on sale.